I recently began to post tributes to some of the deceased members of our clan and would encourage you to do the same. Here is Mary Barefoot posted by another person. I really like this site and hope that you will use it to place permanent memorials on the web for our beloved ancestors. Go to findagrave.com. Click on “Search 82 Million Grave Records” and fill in the template. I search for women by both maiden and married names. To find all Barefoots, just type in the last name and search. Stay away from most North Carolina Barefoots as there is no proven relationship between the two families. 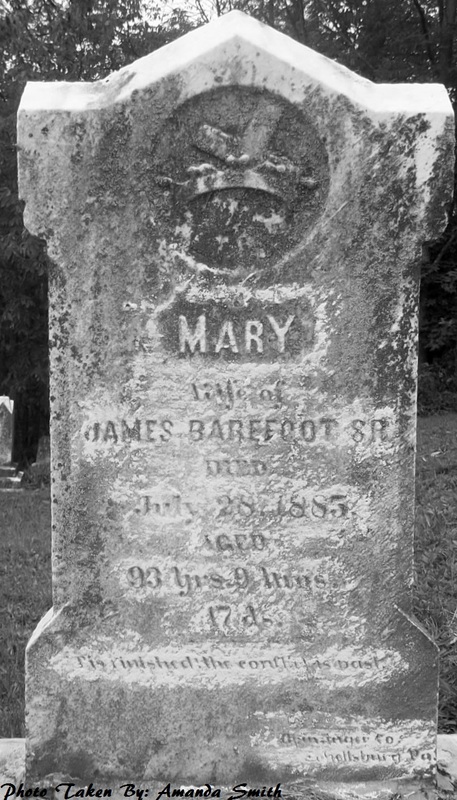 Mrs. Mary Barefoot was born in Frederick Co., Maryland, Oct. 11, 1791. died July 28, 1885. Age 93 years 9 months and 17 days. She lived a faithful life and was a member of the Evangelical Church. She died in the house that she helped to build sixty-eight years ago. She was the mother of twelve children, five sons and seven daughters, two of them having preceded her to the other shore and she lived long enough to see the fifth generation of her descendants. The number of her grand-children living is seventy-two, dead eighteen. Number great grand-children living, one hundred and sixty-five, dead. nineteen. Number of great-great grand-children living ten, dead, two. She was a grand old woman, and the full measure of her life was rounded out to perfection. And dwell in peace at home. Barefoot, Mary (Slick), d. Jul 28, 1885, Aged 90 yrs, 9 mos, 17 d, Wife of James Barefoot. From Sylvia con’t. Note that there are hyperlinks on FindaGrave that will take you to other tributes of her children. You can add photos even if you are not the author of the tribute, but you cannot alter the biography. If you want to add any biography or corrections to the tribute, you can send the information to the author, who may or may not make the change. I did tell the authors of the trubutes that the comments about our Barefoots being of the line of Colonel George Ross are incorrect, but so far, there has been no updating on the tributes.